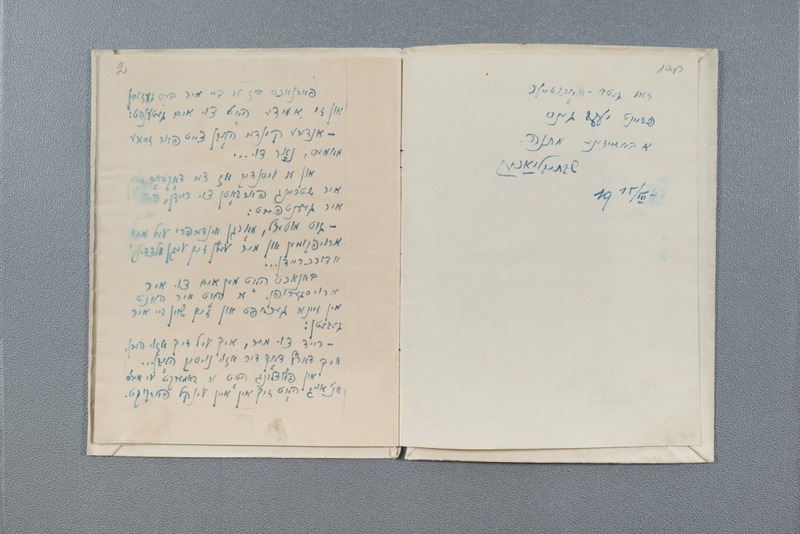 The holdings of the Vilna Gaon State Jewish Museum boast over 80 manuscripts with writings from the Vilna Ghetto: lyrics, poems, reviews, screenplays and short stories. Among them there is a poem by Shabsay Blacher (born in Vilnius in 1904; according to some other sources he was actually born in 1907) Her Last Road (Inventory No VŽM 4563) written in a copybook in blue ink. The flyleaf of the copybook bears the author’s dedication to Jacob Gentz (see illustration VŽM 4563-2). Blacher was among the key founders and actors of the Vilna Ghetto theatre. In addition, he became board secretary of the Literary and Artistic Union and wrote a literary piece in Yiddish titled Ein un cvancik un einer (Twenty One and One) to commemorate the Jewish actors who perished before 1942. It was not by accident that Blacher took to acting in the ghetto. As a child he received traditional education and from 1919 studied at a secular school in Warsaw with Yiddish as the language of instruction. Starting with 1921 Blacher took classes at a theatre studio and in 1924 wrote his first one-act comedy The Artists. He played in the theatre, translated texts, directed plays and worked as a prompter. Blacher graduated from a drama school and became a professional actor. He specialised in playing vivid characters. In 1940–1941 Blacher lived in Vilnius, where he worked as an actor at the comedy and review theatre Remikot, and later joined the State Jewish Theatre in Vilnius. Shabsay Blacher was killed in 1944 in the Klooga concentration camp in Estonia.